If you have read any of my other reviews or blog posts you should know that I am a proud supporter of anything Goruck. From the products they make to their great 5k runs and endurance events. This being said it is that time of year again when I start to sit indoors more and tend to pack much less while at school. I started my Goruck supporting with ordering my first backpack the GR0. I used this pack my freshman year of college and it was great, although I drove myself to upgrade to the GR1 and eventually the GR2 34L. This being said I feel the GR2 is slightly too large and heavy duty for what I need day to day during the school year. I was born and raised in Denver Colorado and am no stranger to the many company's that orbit around that city. North Face is not a new brand to me and I have purchased countless rain/winter jackets over the years. However, the backpack side to North Face is new turf to me. I do like to think of myself as an “expert buyer” of backpacks and so does my wallet. Enter the North Face Surge. The North Face Surge is no new backpack to the line of packs North Face has to offer. The original Surge was introduced to the market in early 2010, this was followed by the Surge 2 and then strangely enough followed again by the 2015 Surge. The Surge is made of 500D Cordura® nylon matte ripstop, 420D nylon, 1680D Ballistic s nylon. I feel that this is the perfect mixture of toughness and weight friendly material. The Goruck line of hydration rucks are now made of 500D Cordura as well and I absolutely love my 15L. The Surge is a 33L pack and feels like my old Goruck Echo. This stat in the end sold me. My 34L GR2 is my favorite ruck and a hands down beast, although I do not need this day to day during school. The fact that this pack is only 3lbs and almost the same storage as my GR2 is perfect. The Surge is also a part of The North Face’s lifetime warranty. 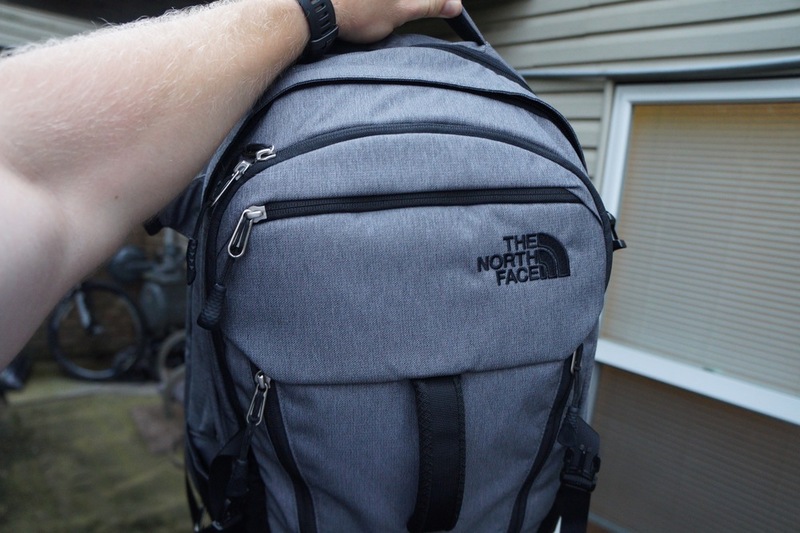 Now the pack itself, on the front is the classic North Face logo on the upper right hand corner. I bought the Grey heather/tnf black color. All of the zipper lines are black while the pack itself is a matte grey. The pack has 6 main pocket, two of which are fully fleece lined. Two on the very front that go the width of the pack, the left is nylon and the right is fleece. The top front pocket is for glasses or your smartphone and can now fit the Iphone 6 plus or any other ipad mini looking phone. This pocket is also fleece lined which is great because the last thing you want is your phone getting cold. Next is the smaller “main compartment” pocket. This pocket has a fleece lined Ipad sleeve and plenty of room for all of your pens, rulers, chargers etc. After that there is the main compartment which is very basic and how it should be. There is a deceivingly large amount of room in which to put larger items such as binders, extra layers, or camera cases. Lastly there is the laptop compartment which zips all the way down to open flat and allow easy access to your laptop. This pocket is also very well padded and sites about 2 inches from the ground to make sure your laptop never slams against anything. On either side of the bag there are stretch mesh pocket for water bottles or other items. This comes standard on most packs but what sets these apart from others is that fact that the mesh is not see-through allowing you to put more important items in them. On the top there is a padded grab handle as-well as a front padded grab handle. This is another simple, yet great addition to any backpack in my eyes. Another must have for me no matter what I am using the backpack for is the comfort of the bag when it is on my back. This bag is one of the most comfortable packs I have ever worn. the back has great support while allowing air to move through and keep your back cool. Lastly there are two compression straps on either side of the bag that allow you to sinch down when the pack is not as full. Overall, I feel as though for a day to day pack for school and work this backpack will do excellent and I am very excited to break it in and see how it preforms. North Face is a great company and I love any company that is confident enough in their products to add a lifetime warranty.